"Energy packed slow-release breakfast. This recipe will make enough for a week. Cut out a section each morning, chop and add milk to almost cover, heat in microwave for 3 1/2 minutes, and enjoy energy til lunch time." 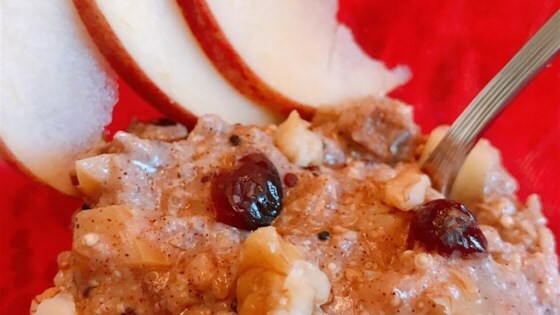 Combine oats, quinoa, raisins, walnuts, almond meal, flaxseed meal, coconut, apple, and cinnamon in a pot; add water. Bring mixture to a boil, stirring regularly; reduce heat and simmer until oats are tender and liquid is absorbed, about 10 minutes. My daughter loved it and right away asked for seconds. I don't think the quinoa cooked through all the way, so I may pre-cook it some next time.